, an English poet, was descended from an ancient family in Leicestershire, and educated at St. John’s-college, in Cambridge, where he took his degrees of A.B. in 1696, and A.M. in 1700, at which time he obtained a fellowship. ' While at college also he is supposed to have written his “Pastorals,” which involved him so seriously with the wits and critics of the age. When he quitted the university, and repaired to the metropolis, he became, as Jacob expresses himself, “one of the wits at Button’s; n and there contracted an acquaintance with the gentlemen of the belles lettres, who frequented it. Sir Richard Steele was his particular friend, and inserted in his Tatler, N. 12, a little poem of his, called” A Winter Piece,“dated from Copenhagen, the 9th of May, 1709, and addressed to the earl of Dorset. Sir Richard thus mentions it with honour:” This is as fine a piece as we ever had from any of the schools of the most learned painters. Such images as these give us a new pleasure in our sight, and fix upon our minds traces of reflection, which accompany us wherever the like objects occur.“Pope, too, who had a confirmed aversion to Philips, while he affected to despise his other works, always excepted this out of the number, and mentioned it as the production of a man” who could write very nobly." Steele was also an admirer of Philips’s “Pastorals,” which had then obtained a great number of readers; and was about to form a critical comparison of Pope’s Pastorals with those of Philips, with a view of giving the preference to the latter. 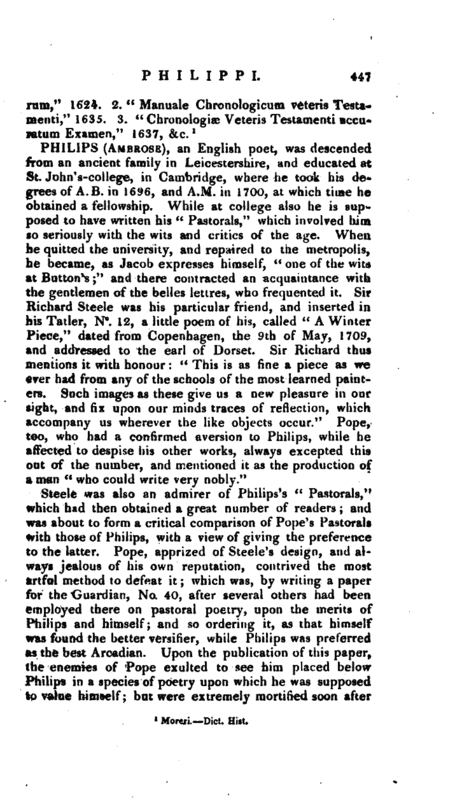 Pope, apprized of Steele’s design, and always jealous of his own reputation, contrived the most artful method to defeat it; vvhiqh was, by writing a paper for the Guardian, No. 40, after several others had been employed there on pastoral poetry, upon the merits. of Philips and himself; and so ordering it, as that himself was found the better versifier, while Philips was preferred as the best Arcadian. 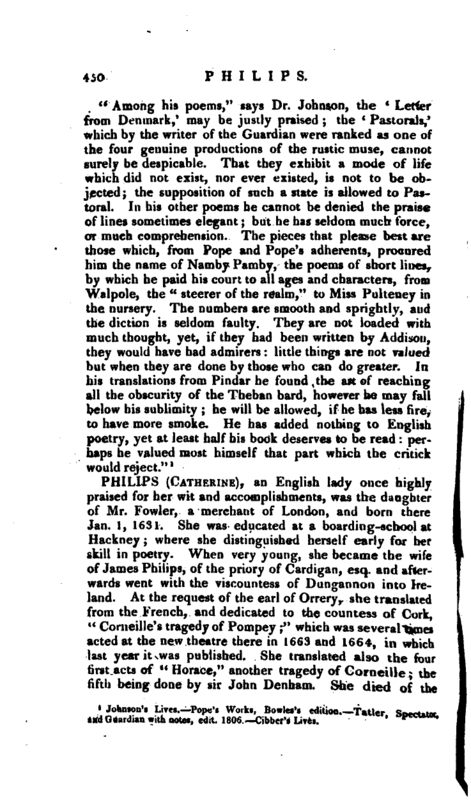 Upon the publication of this paper, the enemies of Pope exulted to see him placed below Philips in a species of poetry upon which he was supposed to value himself; but were extremely mortified soon after | to find that Pope himself was the real author of the paper, and that the whole criticism was an irony. 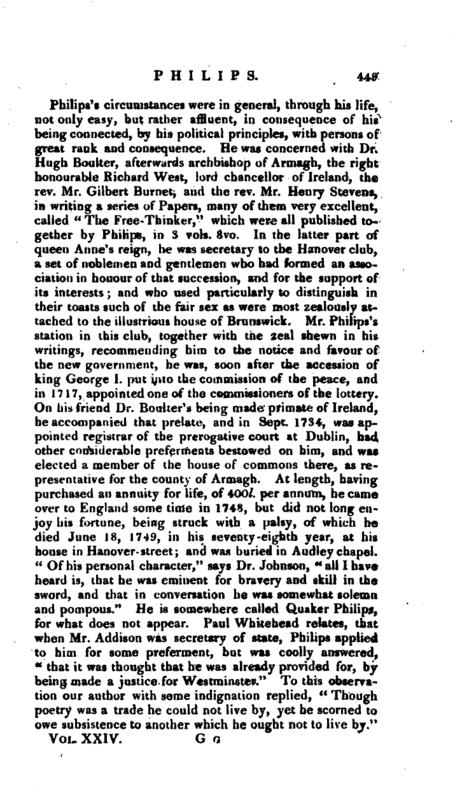 The next work Philips published, according to the common account, was “The Life of John Williams, Lord Keeper of the Great Seal, Bishop of Lincoln, and Archbishop of York, in the reigns of James and Charles I.” He is supposed to have undertaken this, for the sake of making known his political principles, which were those of the Whigs. But we doubt whether this, which was published in 1700, was not prior to the publication of his pastorals. In the mean time, he fell under the severe displeasure of Pope, who satirized him with his usual keenness. It was said he used to mention Pope as an enemy to the government; and it is certain that the revenge which Pope took upon him for this abuse, greatly ruffled his temper. 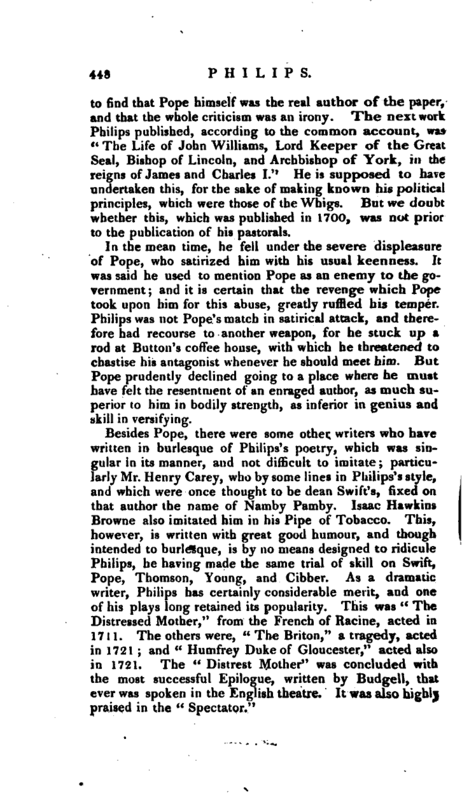 Philips was not Pope’s match in satirical attack, and therefore had recourse to another weapon, for he stuck up a rod at Button’s coffee house, with which he threatened to chastise his antagonist whenever he should meet him. But Pope prudently declined going to a place where he must have felt the resentment of an enraged author, as much superior to him in bodily strength, as inferior in genius and skill in versifying. Johnson’s Lives. Pope’s Woiks, Bowles’s edition. Taller, Spectator, and Guardian with notes, edit. 1806. Gibber’s Lives.